I’m a literary editor and writer’s mentor, based in Brighton. I grew up in rural West Sussex by the sea, but after many years in London, I returned to the seaside in 2001. My daughter was born in 2005. My full surname is Orson-Jones, but I have used O-J since my friends at school decided it was less of a mouthful! I started my career at the BBC and was on the collective of the first incarnation of the young woman’s magazine Shocking Pink. I then worked for bands, record companies, MTV and finally the music research organisation, MRIB. One of the bands I worked for was The Slits, and I worked with Viv Albertine on her autobiography Clothes, Clothes, Clothes, Music, Music, Music, Boys, Boys, Boys, which came out in June 2014, and its successor, To Throw Away Unopened, which will be published in April 2018. 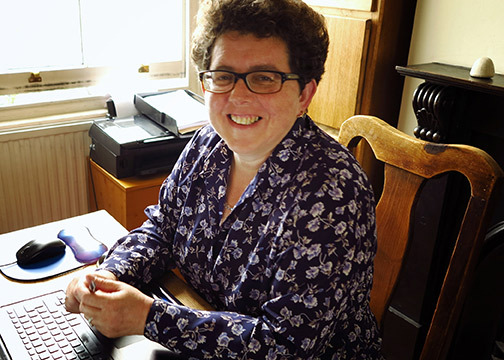 Since 1998, I have worked as a book doctor with a wide range of authors, with experience ranging from absolute beginners to TV scriptwriter Lilie Ferrari and Booker Prize shortlisted novelist Sarah Waters. I have worked with Sarah on all of her books, beginning with Tipping The Velvet, before she had an agent or publisher.